This will be a fantastic addition to the site as it tells the story of Policeman James's thoughts and feelings about leaving his native Scotland for a new life in Australia and the arduous journey he was to face before reaching Australia. “I enjoyed this event – interesting, relevant subject matter and the enthusiasm of the author combined with his own songs and the invitation to contribute to ongoing research. This is now a few times Gordon has given talks on the Mars and he has met great reactions at each. I've finally managed to get the database working again. Now I'll be able to get back to the task of adding new material to the site. I spoke to Gordon today who told me the Blyth Hall Talk went very well, more details on this later in the week. The problem with the database has still not been resolved so as a very temporary measure I have reactivated the old one. This is shown on the menu as Search for Mars Boys Old. The interface is awful but it at least allows the database to be searched. I will leave it open to public viewing at the moment. Sorry about all this but because the normal interface has always worked it is difficult the track down the error it points to something outwith the site. I had an email from a site member today who was experiencing problems using the search for boys facility. I checked it and there appears to be a problem which didn't exist last week when I checked. I will try to sort the problem out and hopefully post my success here. When registered members now logon, you will notice that you see a new screen which is the site blog. This change is just to ensure that all our members are aware of any new additions to the site. Please feel free to add any comments on the blog. Also I have now enabled the avatar section. This means that if you have uploaded a photograph of yourself, it will now appear on your login form after logging on. I will also be making some changes over the next couple of weeks to allow members to communicate with each other and to share information. There have been a number of new Mars stories placed in the appropriate years on the site today. The new stories are in the years 1888, 1889 and 1890. Gordon has added another 100 Mars Boys' names to the database. He has been experiencing some technical difficulties over the past few months but is now back connected. We have made a change to the permissions on the site ahead of adding new data to the databse. Any visitor who wishes to search the Mars databse must now register on the site. Registration is still free. We feel it is only fair that our registered members are allowed more privileges. Sorry, if this causes any inconvenience, but it makes more sense in the long run as we hope to add other features. We would also encourage you to make more use of the Mars forum and to add to your member profile, allowing you to communicate with other members. Comment can also be made by members on the Mars Blog. Some new Mars Stories have been added this morning . A Grand Concert on the Mars (Mars Stories/Mars Events) and also some in the sections 1881, 1886 & 1887. There are a lot of new items to be put on the site, so keep checking. Some new additions to the Mars Stories and loads more to come. 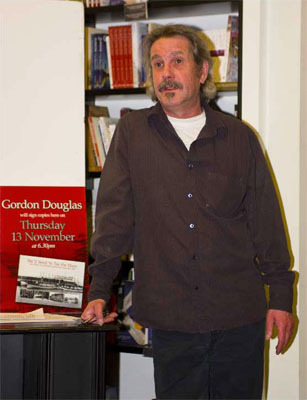 Met Gordon the other day and there is absolutely brilliiant stuff to go on the site, once the new book is published. I was just about to wrest it out of his hands. But, as they say, "Patience is a virtue", I can't wait to add it to the site. Gordon is to give a talk on the Mars at the Blyth Hall in Newport on Monday 29th June 2009 at 7.30 pm. Tickets are £2 each and are available by telephoning Newport Library on 01334 659376. Waterstone's bookshop will also be there and Gordon will be available to sign copies of the book "We'll Send Ye Tae The Mars". New stories on the blog mainly 1880 - 1886 but some more for later years, two new years added 1920 & 1923. Some great pdf files sent by Helen Mowry of Thomas McKintosh. Thomas McKintosh was a former Mars Boy who had an illustrous career firstly in the Black Watch and then as a State Trumpeter and Macer at the High Court in Edinburgh. The pdf's are from the official government London Gazette and Edinburgh Gazette. Click Here to view Thomas McKintosh page. I've just uploaded a picture of a cutting which Gordon found. the February 19th 1890 edition of the newspaper "The Piper O' Dundee".